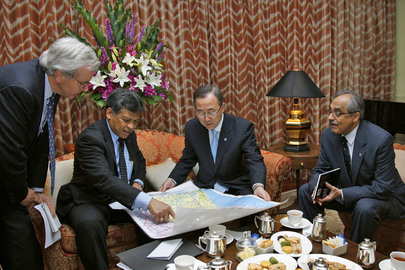 On Sri Lanka, UN's Nambiar Resists Briefing the Council on His "Confidential" Trip: Is a USG Subpoena Needed? UNITED NATIONS, April 21 -- Despite having been sent as the UN's envoy to the "bloodbath on the beach" in Sri Lanka, Ban Ki-moon's chief of staff Vijay Nambiar is now reluctant to give the Security Council even a closed door briefing on the crisis, sources told Inner City Press late Tuesday. One well-placed Council diplomat said that despite all 15 members, including China and Russia, agreeing to an "informal interactive dialogue" with Mr. Nambiar, who has just returned via India from three days in Sri Lanka, they were told that Nambiar views the matter as "too sensitive" even for discussion behind closed doors. Nambiar argued that as a "mediator," what he discussed with Sri Lanka's president Mahinda Rajapaksa and his brothers was "confidential," even from the Security Council. One Permanent Five member of the Council, in this account, has protested Nambiar's refusal, which will be transmitted to Nambiar and the Secretariat by Council President Claude Heller on Mexico. At press time late Tuesday, the projected Wednesday afternoon briefing of the Council, at least by Nambiar, is in doubt. Nambiar has argued that "it is mostly a humanitarian and not a political situation," as Council source, and China before that, have put it. Thus, Nambiar argues, the Office for the Coordination of Humanitarian Affairs should give the briefing, not him. But it is Nambiar who with such fanfare flew to Colombo. And OCHA chief John Holmes, who has not been in Sri Lanka for weeks, is now in China. The only other option would be Hitoki Den, below director level in the UN Department of Political Affairs, who accompanied Nambiar on his trip. Even regarding Myanmar, Under Secretary General Ibrahim Gambari briefs the Council, and then takes questions from the media. Council and other UN sources expressed amazement that in this Sri Lanka case a UN Under Secretary General would attempt to rebuff a request to brief the Council, on one of his few pieces of public work during Ban Ki-moon's administration. Perhaps the Security Council needs to serve Nambiar a subpoena... Watch this site. As of this press time more than six and a half days later, the formal answer has been referral to Minister Miliband's April 12 statement, and this. Now, the same question has been posed to another Permanent Five member's Permanent Representative. As more answers arrive or are released we will report them on this site.